At a conference I met a hospital CEO and began chatting. I asked him about his hospital and he told me about some of its challenges and strengths. The conversation turned to physician recruitment and I asked him how many physicians were admitting patients to his hospital, and he didn’t know. I pulled up TorchInsight.com on my phone, pulled up his hospital’s dashboard and was able to list them off. While this was more of a party trick than a practical use case, it does show one example of how organizational-level data can be accessed and use. In my last blog post, I took a look at healthcare markets and did a quick analysis of Alzheimer’s disease. Now I get to dig into the art of organizational analysis. There is no standardized definition of organizational analysis, but it always include entity- or organization-specific data that allows the analyst to assess characteristics of named organizations. 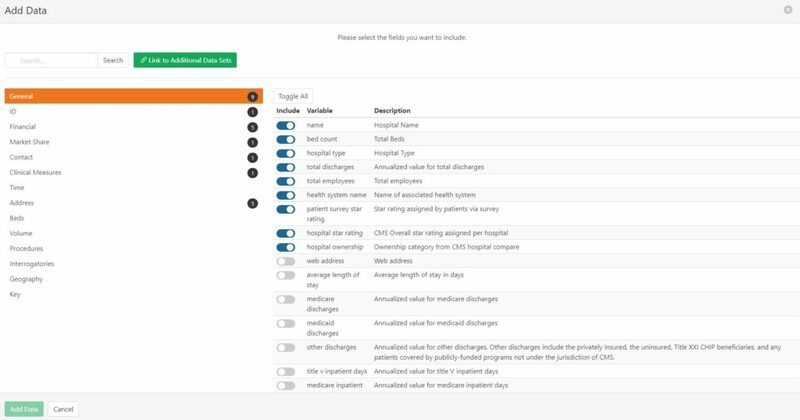 Torch Insight includes data on hospitals, health systems, physician groups, skilled nursing facilities, health insurers, and many others. The underlying data is derived from dozens of different sources, but the ultimate goal is to aggregate the data so that the user can get a complete perspective on the organizations. The data can help evaluate competitors or potential partners, to identify sales targets, do an academic analysis, or countless other assessments. Once you have the data, the limit is how imaginative you can be. Hospitals represent 32% of the healthcare system’s cost, and I thought it would be interesting to do some organizational-level analysis on the biggest hospitals in America. I’m going to start by just pulling out the largest hospitals in the country and, based on 2016, there are 20 hospitals that had more than 50,000 discharges. The largest hospital, in terms of discharges, is Florida Hospital Orlando, which is part of the Adventist Health System. 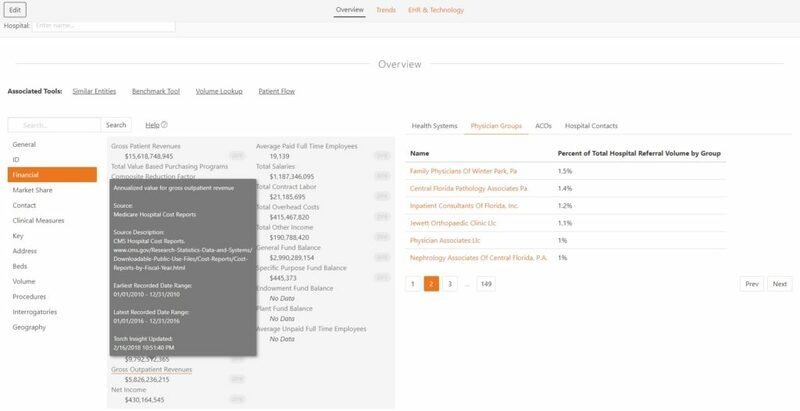 By clicking on the hospital I’m able to jump to its dashboard which provides data on dozens of facets of the hospital, including contact information, financial data, quality scores, health information technology platforms and more. 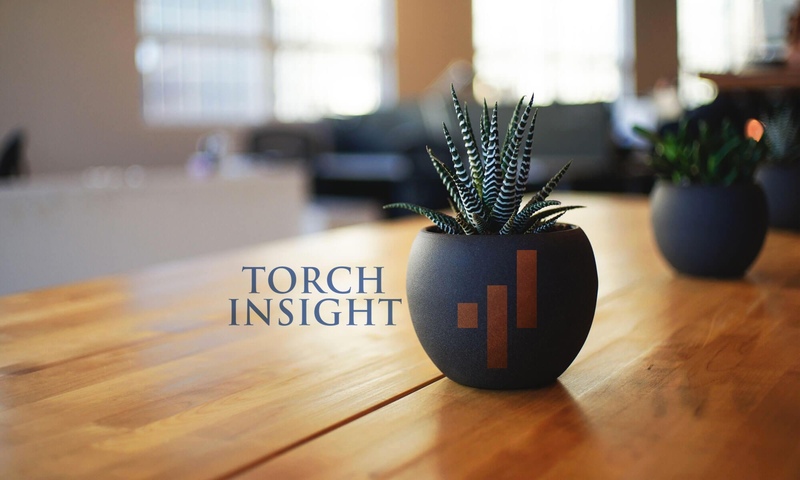 Dozens of different origin files are incorporated into this, including publicly reported data, data calculated by Torch Insight and data that has been manually collected. The metadata management system tracks where the underlying data came from, as seen in the screenshot that shows the underlying financial data source as hospital cost reports. Another example of factual data is the quality scores that are collected by the government for Hospital Compare reporting. Dozens of different measures exist, which can also be benchmarked against other hospitals. An important part of any analysis is understanding how things are changing. 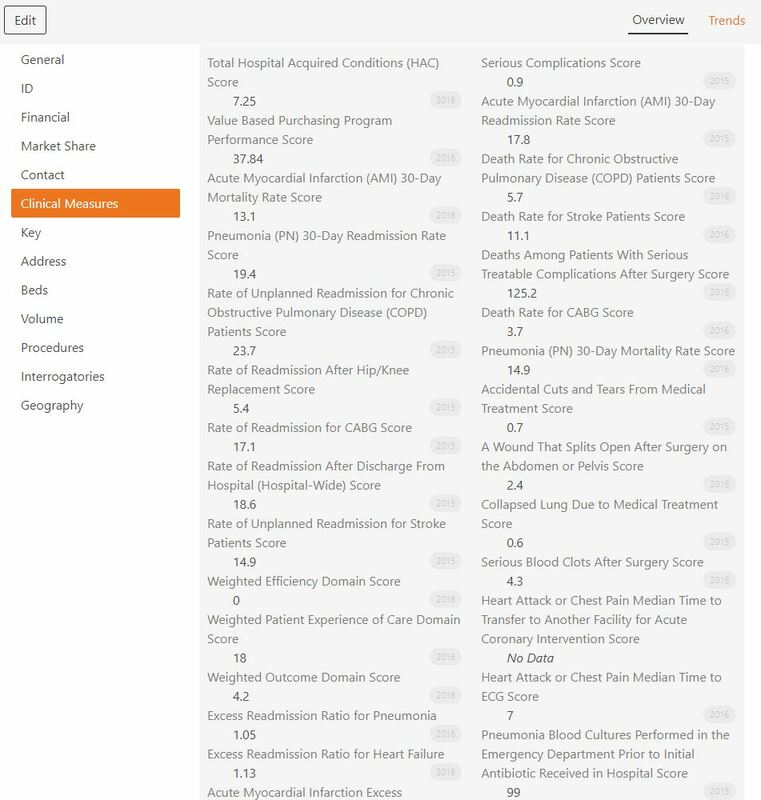 The dashboard includes some default trend data – in this case net patient revenues and bed counts – but it can be customized to include dozens of longitudinal variables. An important component of Torch Insight is the relationships that it shows between different organizations and entities. 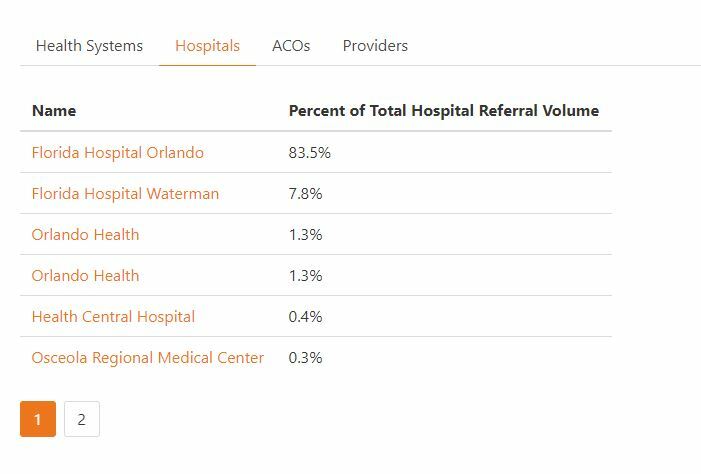 Florida Hospital Orlando is part of Adventist, and by clicking on the connection an analyst can explore the broader system’s financial performance or look at a map of the hospitals in the system. 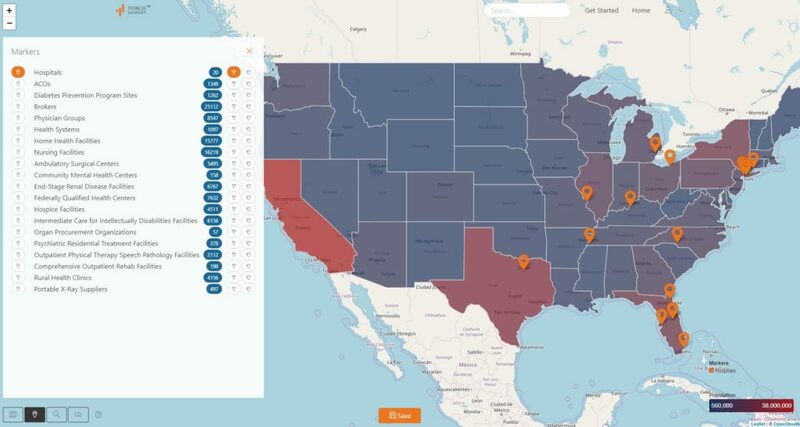 In addition, it shows the connection of hospitals to physicians with the ability to see which physicians are admitting to the hospitals or the system. The physician groups can be explored, as well, and you can learn where the physicians are admitting. If you want to export data, you can also go through the data export tool to pull out the raw data. There are hundreds of data fields to work with. I decided to export the 148 hospitals with more than 25,000 discharges. Once exported, you can easily evaluate whatever seems interesting with whatever tool you prefer (Excel, Stat, SAS, R, Tableau, or dozens of others). 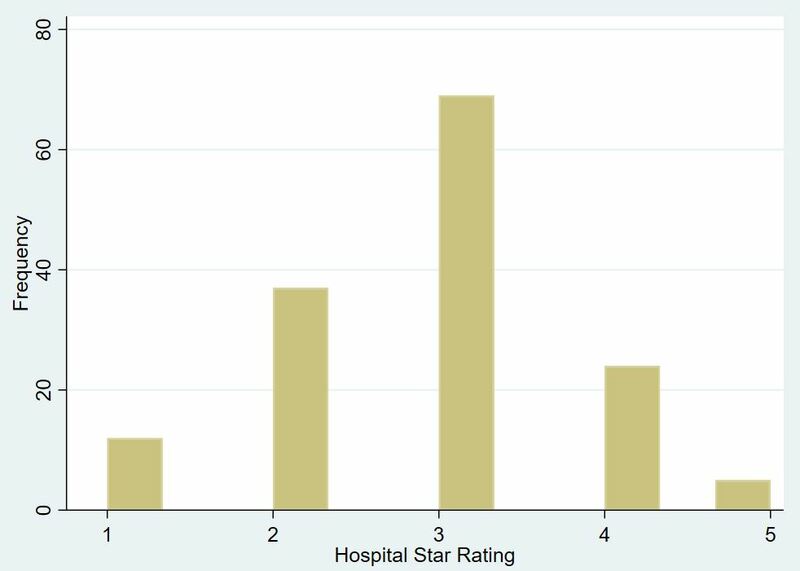 I did a quick correlation to see if the relative market share of each of these largest hospitals was correlated with their value-based purchasing scores (they weren’t, p=0.55) and here, I made a histogram of their overall star ratings. Organizational analysis starts with data about specific entities and then allows the user to answer questions about them. In future posts I’ll provide more specific examples and case studies, including conducting some analyses that actually answer relevant policy and business questions. Next PostNext Where does Torch Insight data come from?